The regional Dutch newspaper Gooi en Eemlander recently devoted an entire page to the topic of angels. "Angels announced the birth of Jesus Christ 2,000 years ago. But angels aren't only around at Christmas. They can be found throughout the ages and in all religions. In the last 10 to 20 years there has been a real surge [in angel reports]."  USA: Young boy "touched by angel"
Korean leader's life saved by Christ? "Jews are discovering Jeshua is the Messiah"
Did Jesus Christ come to Nairobi, Kenya? In recent years there has been an upsurge in reports about encounters, visions and photographs of the Christ and angels. There seems to be a wide array of experiences: Apparitions of Jesus or angels to a hitchhiker which is disappearing from driving cars after asking "Did you know that the Christ is in the world?" Also there are reports about help from strangers in emergency situations, which then disappear without a trace. Increasingly, people are discovering apparitions on photographs. sign of the Second Coming?" "The tall figure of a barefooted, white-robed and bearded man appeared from nowhere and stood in the middle of the crowd ... I looked at my watch. It was 4.15 pm ... Strange, sporadic light wafted on top of his turbaned head, his feet and his entire body." "The man whispered something to Akatsa for about two minutes. She later informed the crowd that the strange man would address them. In clear Swahili, which had no traces of accent, the strange man announced that the people of Kenya were blessed, especially those who had gathered at the venue that afternoon." 'We are nearing the time for the reign of heaven. But before that I shall come back and bring a bucketful of blessings for all of you'", so the wording of the Kenya Times. A photographer was also present and took several photos of the man who took up the offer of Mr Gurnam Singh to give him a lift. Two minutes later upon reaching a bus terminus he asked him to stop the car as he wanted to alight and head for heaven. On getting out, he did not ascend. He walked a few paces beside the road and simply vanished into thin air. Several people who witnessed this were astonished by his mysterious disappearance. In the following days the appearance was on the front pages of the world press and international television stations such as CNN and the BBC reported about it as the "Miracle of Nairobi". 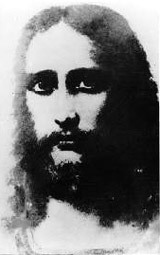 Website about visions of Jesus et al. including photos which have been taken. Sister Anna was at a press conference in Rome on 15 February 1994 and provided detailed information and introduced a book, in which she claims that "Jesus Christ" appears to her every Thursday. She passed two photographs around which she had taken in 1988. On one of the photos he is weeping tears of blood. Prior to her meeting, Sister Anna's face becomes swollen and painful and the following day she weeps blood. Her doctor remarked that this is an "absolutely inexplicable phenomenon from the scientific and human point of view". He also commented on an "extraordinary aroma of freshness" she exudes during this process, which he concluded is the "perfume of the Christ". by: Rev. Jude Mbukanma, O.P. The book contains messages that Sister Anna Ali received in personal encounters with Jesus.